Our bedroom in Matera. Image courtesy of Sextantio. We stayed in Cave 19. From the outside, the rooms are disguised. 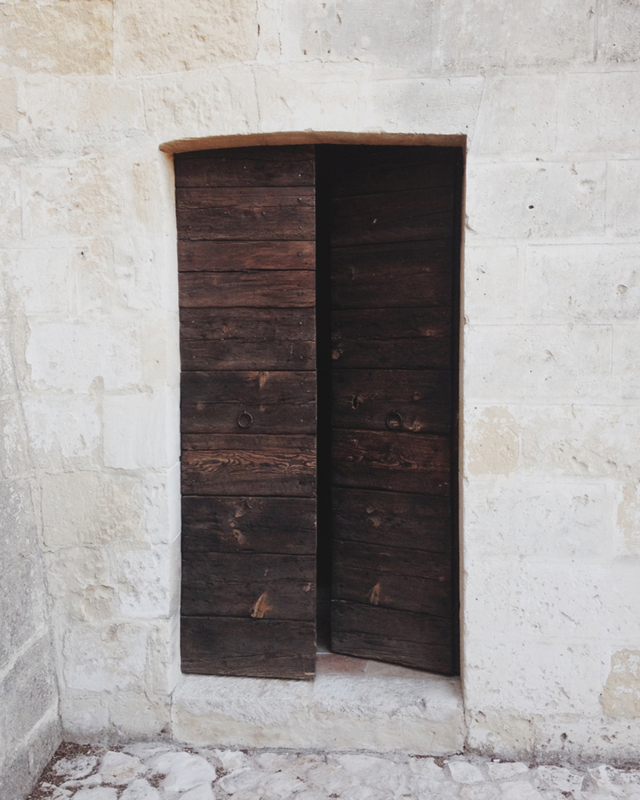 You just see old wooden doors with no signs or numbers. Cave 4 features a linear floorplan. Image courtesy of Sextantio. By combining traditional materials and ancient objects in a minimalistic way, Sextantio manages to be ageless and contemporary at the same time. Opening the window in our room to see the mountains and hear a stream flowing down at the valley. 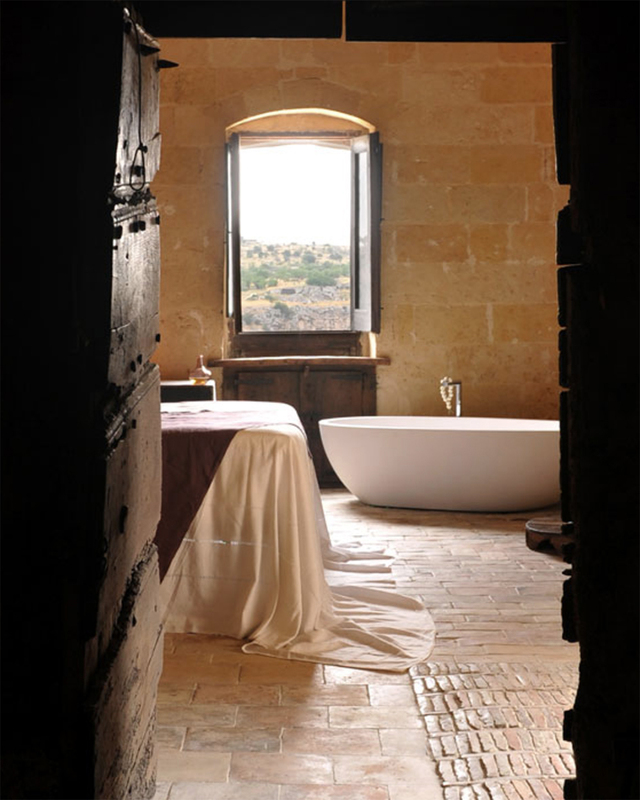 Out of all stunning locations and comfortably gorgeous hotels in Italy, the Sextantio hotel in Matera must be my favorite. Since my first visit I have been longing to go back. More than just accommodation, Sextantio is a project that aims to breath life into the forgotten and diffusing villages of Italy. 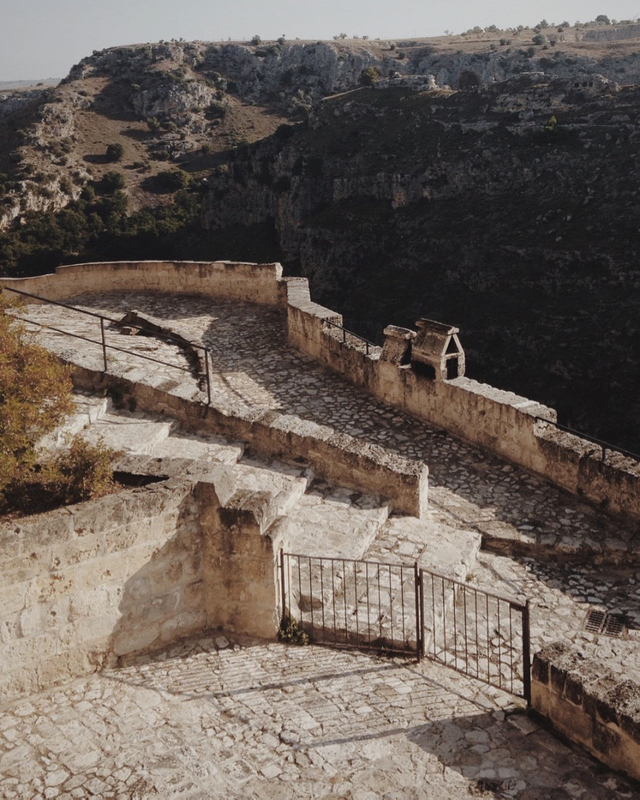 Two beautifully restored hotels are open, one in Abruzzo and this one in Matera, and I hear there are several more on their way. For me, Sextantio defines the term new luxury. It’s all about the well-designed experience. I love the quality and originality of everything they do: the service, the interior design, the philosophy and passion behind their business. 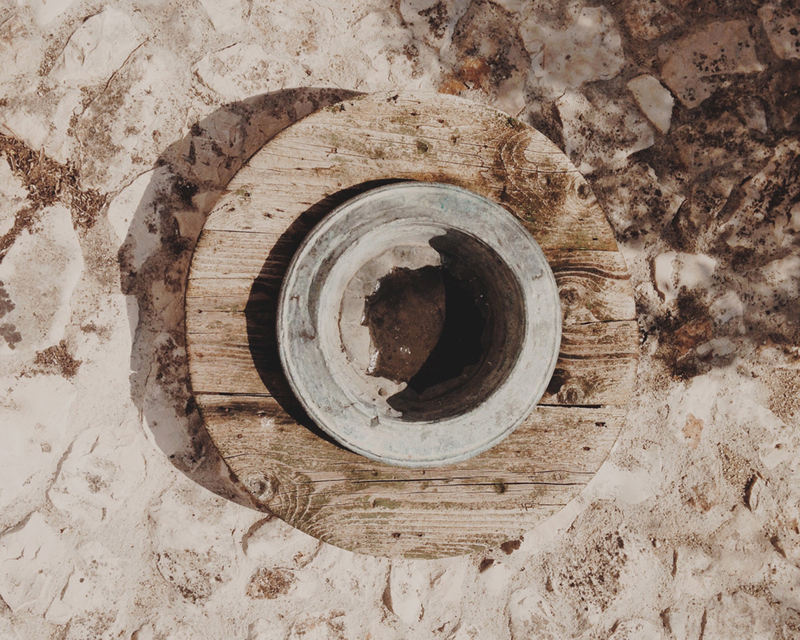 We arrived in Matera on a hot afternoon in July and, for a couple of days, our life was really simple. We ate well, enjoyed the slow rhythm of the south, slept like babies and woke up the next morning feeling happy and refreshed. The property consists of 19 rooms and large dining room where the breakfast is served: fresh fruit and juice, bread, cheese, cold cuts and pastries. The table setting is all white: pressed linen tablecloths and napkins, and handmade pottery. The earless ceramic mugs are used for water and juice too, to keep them cold. 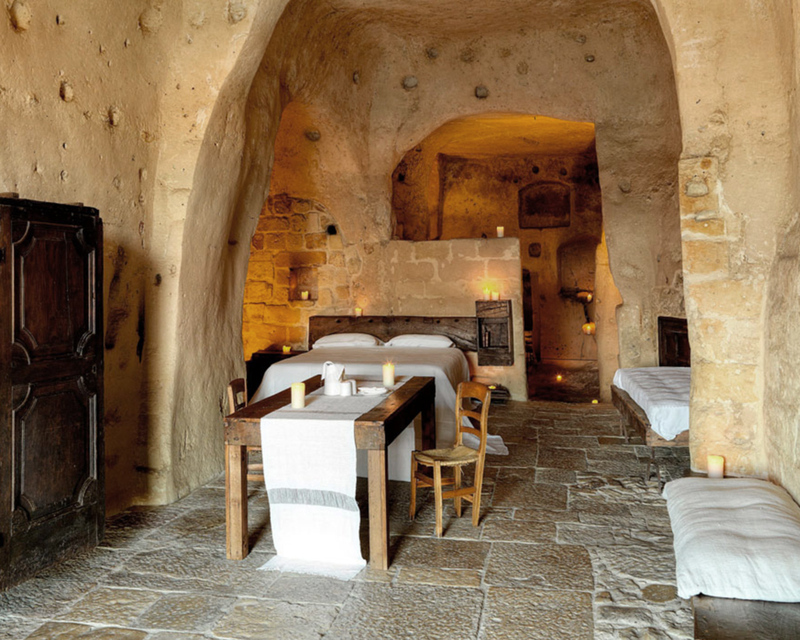 Each room and suite is a unique cave dwelling. To retain the soul of the ancient spaces the design is focused on preserving the original features: the dim light, the uneven floors and walls, the raw materials. As a contrasting element, the bathrooms are equipped with contemporary sanitary ware in the most clean designs. The ascetic, minimalistic style refreshed with white textiles makes each space feel calm and sober. With the dim light, cool air and thick walls you feel totally secluded in your cave – and often forget how hot and bright it is outside. Open a window or a door in the morning and for a moment you are blinded by the sun. I love the feeling. There is a world out there, and it is up to me to decide, whether to go embrace it or stay in and hide for a little longer.